At first I had to check my better-than-usual filing system to find out if I missed Stephanie out of the banana list. Such a banana envelope, but I don't think I did and apart from the colour there isn't a hint of banana elsewhere. Instead Stephanie has sent me MORE BADGES. And these are even more remarkable! Both are mounted on cards. 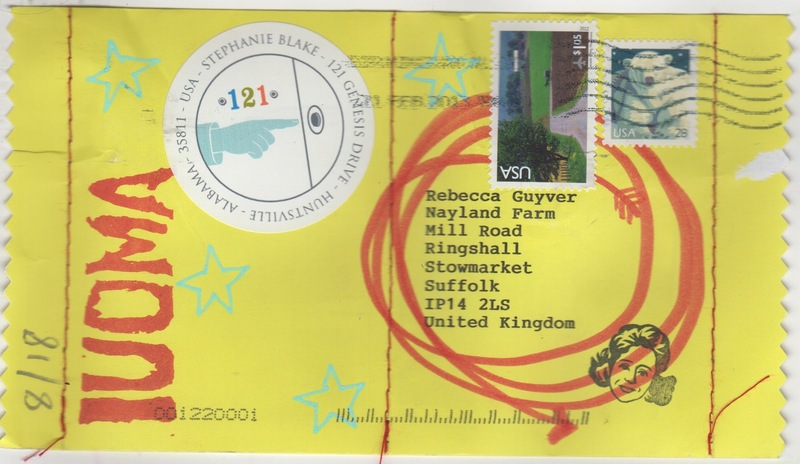 One is a teeny tiny vispo collage. I am proud to say that I can just about read the writing with my bare eyes. 'Practice temporary tattoos,' it exclaims. The other card is more of a statement, ' i wish I could do one thing well,' and across the brave little boy's chest are the words 'strong'. This one is equally beautiful. I love stephanie's style, no wonder she has a trash pulitzer! Can't wait to pin them on me, although like everyting Stephanie sends, these are so perfect as they are... that you hate to unpin, unwrap or change their context. My mass mailing hasn't been unwrapped yet. We'll see.